Manufacturer & Exporter of GPS Based Master Slave Clocks. Our product range also comprises of LED Video Display, LCD Video Wall and LED Display. Owing to our rich industry experience, we are manufacturing, supplying, trading and exporting GPS Based Master Slave Clocks. 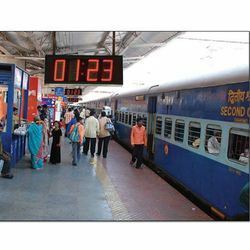 Offered clock is LED based and it can be used at various public places like railway stations, bus station, BPOs, factories and corporate offices. These clocks receive the time from the GPS receiver units located inside the clock. Our range synchronizes the time with appropriate satellite signals and converts it to the accurate time as per the location of the clock. Looking for GPS Based Master Slave Clocks ?